How do political candidates and committees spend their money? Who Runs Philly? is an ongoing project from Philly Power Research focused on highlighting the powerful people, organizations, businesses, and interest groups that shape Philadelphia. As part of this project, we’re creating tools that allow you to easily explore publicly available campaign finance data on your own. The tool below lets you explore expenditures from political candidates and committees. To explore donor data, check out our tool: The Philadelphia Campaign Finance Data Explorer. The Expenditures Explorer allows for searching and visualizing money spent by political candidates or committees as reported to the Philadelphia Board of Ethics electronically between 2014 - present. Expenditures include contributions to other political committees and anything else that money can buy — from advertising and political consultants to hotel stays and hoagie trays. Expenditures are visualized as a tree map grouped by the political committee doing the spending. 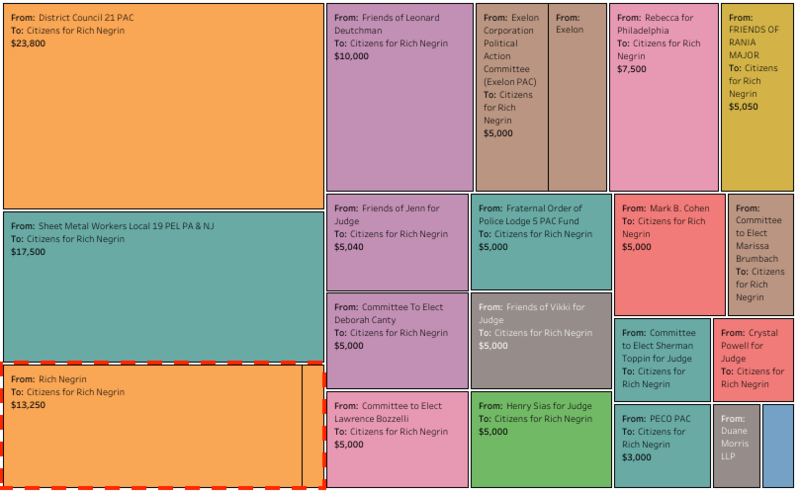 Each isolated rectangle represents the total spent by a political committee. Within those rectangles are smaller rectangles representing individual expenditures. The larger the rectangle, the larger dollar amount spent. Clicking or moving the mouse over a rectangle will show details of that expenditure [usage example]. Since expenditure data is so vast, we’ll give some examples of different ideas to explore which could be applied to any candidate or committee. When a candidate decides to run for office, the first contribution they get is often from their personal bank account. Here we’ve selected “Citizens for Rich Negrin” in the “To” field (these fields are searchable so you can type in “negrin” and press enter), selected all years, and changed the lower bound of the “amount” range to $0 so we can see all reported expenditures [open view] [usage example]. Now, we can see any entity that gave money to Rich Negrin’s 2017 campaign for District Attorney. Outlined with the dotted red line are two expenditures, one from 2016 and one from 2017 from Rich Negrin to his own campaign —“Citizens for Rich Negrin” — totaling $14,250. With that money Rich Negrin kicked off his campaign for District Attorney. This same view also shows committees that reported giving to Citizens for Rich Negrin. We can see that the Fraternal Order of Police Lodge #5 PAC gave $5,000, Rebecca Rhynhart’s “Rebecca for Philadelphia” committee gave $7,500 and several judicial candidates gave between $2k and $10k. These financial transactions seem to mirror political transactions – the Fraternal Order of Police endorsed Negrin for District Attorney in the Democratic Primary and Rhynhart’s name and the names of contributing judicial candidates appeared on sample ballots paid for by Citizens for Rich Negrin. The Philadelphia Democratic Campaign Committee, or “Democratic City Committee” is Philly’s Democratic Party, chaired by former congressman Bob Brady since 1986. Under Bob Brady are 69 ward leaders from the 66 wards in the city, and under those ward leaders are committee people, who you might see handing out sample ballots outside the polls on election day. You can find the ward you live in on this map. An endorsement from the Democratic City Committee is a major key to victory for any political candidate in Philadelphia, especially for lower profile races. As an example of the influence of Democratic City Committee, 51 judicial candidates ran in 2015 and only one candidate endorsed by Philly’s Democratic Party lost. Endorsed candidates are expected to contribute to the Democratic City Committee to cover things like printing the sample ballots committee people are expected to hand out at the polls on election day. Let’s take a look at how the City Committee spent that some of that money in 2018. We’ll select only “Philadelphia Democratic Campaign Committee” in the “From” field, “2018” in the year dropdown, and change the lower bound of the “Amount” filter to $8k [open view] [usage example] to narrow it down to larger expenditures. The top expense at $52,755 was paid to Penns Landing Caterers, an event space and catering company. Next biggest expense is $44,814 to Strassheim Graphic & Design, a minority owned unionized print shop. Richard Subbio is a former Bob Brady staffer and there’s a handful of ward leaders: Louis Agre (21st), Shirley Gregory (49th), John Sabatina Sr. (56th), William Dolbow (35th), Steve Jones (52nd). Two PACs related to the Democratic City Committee are the Genesis IV PAC and Liberty Square PAC. These PACs are run by long time Philly Democratic Party insiders and spend in ways similar to Democratic City Committee. You can examine how these two PACs spent money between 2014-2018. Wards also have their own political committees which can spend as they wish. Who gives money to your ward and how is it spent? You can find the ward where you live and search for its expenditures and contributions. Most ward committee names have been changed to fit a consistent format, for example “44th Ward Democratic Committee.” You can select all years to see your ward’s spending since 2014. Both Helen Gym and Allan Domb were first time candidates in 2015. Gym, an activist and advocate for public education, and Domb, a millionaire real estate developer who largely self-funded his own campaign. We can examine if there are also big differences in how these two campaigns spent money in 2015. In the “from” field we’ll search “domb” and select “Allan Domb for City Council” and then again in the “from” field we’ll search “gym” and select “Friends of Helen Gym”. We’ll select only the year “2015” and set the lower amount at $5,000 [open view] [usage example]. Here Allan Domb is the large purple rectangle on the left, Helen Gym the small green rectangle on the right. We can mouse-over or click the smaller rectangles to examine individual expenditures. The biggest rectangle by far represents TV ads that Domb ran, produced by Donnybrook Productions, another is an $89k spend with media company Jamestown Associates, who also worked on advertising for the Trump campaign. There’s a $45k payment to Sabatina & Associates, a firm owned by John P. Sabatina, Sr., leader of the 56th Ward in Northeast Philly. Rounding it out there are a few payments to individuals, presumably political consultants in the $10k range, and a $5k contribution to the Committee to Elect Lynne Abraham. Helen Gym’s largest expense was a $137,769 payment to direct mail firm Mission Control, Inc, followed by $20k in radio advertising spend split between local radio stations WURD and KYW. There’s $19k to payroll company Paychex, $13k to Democratic City Committee, and $10k to Rittenhouse Political Partners, a political fundraising consultancy. In the primary and general elections, Domb spent a little over $1M on television advertising alone, running ads about how generous he’d be if elected. Gym spent $158,529 on direct mail and advertising on local radio. Examining candidate spending can help us understand how campaigns work and what they think will help them win. Gym and Domb were both elected in 2015, with Domb paying $7.83 per vote and Gym paying $1.83 per vote. If you’d like to explore further, you can see which wards these candidates gave to. Lower the “amount” to $0 and type “ward” in the “Quick Find To” field. You can mouse over the highlighted rectangles to see details [usage example]. The only wards receiving contributions from both Gym and Domb in 2015 were wards 5 (Center City), 57, and 66A (Northeast Philly). We hope you found this interesting and maybe even inspired with new ideas about what to explore. Digging into campaign spending doesn’t even necessarily have to be political. Sometimes you can just ask weird questions. For instance, who spent money at Little Pete’s (RIP Little Pete’s). Or even who takes Ubers and Lyfts everywhere? You can share what you find using the share button at the bottom [usage example]. Click that button and copy the link (outlined in dotted red here). That will link to your current view. If you have any questions or find anything interesting, share the link with us through @ResearchPhilly on Twitter or @Phillypowerresearch on Facebook. Source data includes only “Schedule III” expenditure submissions since 2014 within TXT records provided in year-to-date transaction files. Any expenditures that were submitted via handwritten reports are not yet included. Records were considered to be duplicates and removed if the filing_entity, entity_name, year, filing_cycle, and amount were identical. Data was normalized using OpenRefine, with this edit and merge history.